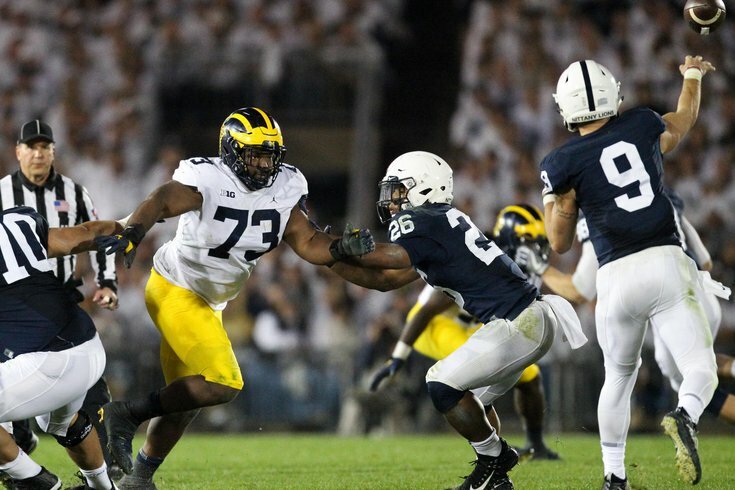 Michigan DT Maurice Hurst would be a great fit in the Eagles' defense. Leading up to the 2018 NFL Draft, we'll be taking a look at each of the Philadelphia Eagles' positional groups. We'll determine if the Eagles are likely to select a player at that position with one of their six picks, as well as note some players who make sense. Today we'll look at defensive tackle. The Eagles have their defensive tackle starters set for at least the next couple of years in Fletcher Cox and Timmy Jernigan. They also replaced outgoing free agent Beau Allen with veteran Haloti Ngata, and will be returning Destiny Vaeao and Elijah Qualls. A look at the Eagles' depth chart at DT. In 2017, the Eagles are in good shape at defensive tackle, but they could certainly look to add talent to the rotation with the long-term in mind. Here are a few defensive tackles who could make sense for the Birds. In 2017, Hurst had 59 tackles (13 for loss) 5.5 sacks, and a forced fumble. Those numbers aren't great, but make no mistake, Maurice Hurst is really good player. He's quick, fast, he sheds blocks, and he constantly makes plays on the other side of the line of scrimmage. At 6'2, 280, Hurst is far from a prototypical defensive tackle. Geno Atkins fell all the way to the fourth round in 2010, and Aaron Donald to the 13th overall pick in 2014, despite being clearly more talented than many of the players taken before him. His size, along with a heart condition, could cause Hurst to drop to the Eagles at pick No. 32. The big-bodied defensive tackle wasn't expected to blow up the combine, but his disappointing numbers will raise some concerns about his athleticism at the next level. Settle labored through a 5.37-second 40-yard dash and posted minimal measurements in the jumps (23.5-inch vertical jump and 8-foot broad jump). He followed it up with a disappointing workout that highlighted his marginal change-of-direction skills and burst. Settle's tape suggests he has the potential to dominate as a top-50 pick, but the sub-par performance at the combine could force evaluators to pause before giving him a second-round grade. In 2017, Settle had 36 tackles 4 sacks and 11.5 tackles for loss. Those aren't eye-popping numbers, but Settle's game tape is more impressive than his stats or his Combine numbers. If the Eagles traded back, I could see Settle being more of a value in the second or third round. Hall dominated his competition at a lower level of football in college, but his combination of strength and quickness should translate to the NFL. During the 2017 NFL Draft, the Eagles selected Sidney Jones, who had ruptured his Achilles during the pre-draft process, knowing that he likely wouldn't play at all during the 2017 season. He was a pick for 2018 and beyond. In 2018, a player who might make sense as a draft-and-stash guy would be Kentavius Street, who tore his ACL while working out for the Giants a week ago. Unlike with Jones a year ago, drafting and stashing Street won't take a second round pick. He can likely be had with a sixth- or seventh-round pick.